We both met through our blogs, and it's quite a treat to know another fellow Korean who has a passion for food across the globe in Germany! She shares one of her favorite German recipes in this series with Seoul in the City. S: Have you visited Seoul? Do you have family or friends here? B: Yes, quite often to visit family and friends. I even worked for a Fashion Brand in Seoul. How did you start becoming interested in Korean food or cooking in general? My halmoni was, and my mother is a passionate cook. Inspired by their passion and love, I too started cooking. My first dish ever (as a teen) was Doenjang Jjigae and it turned out...strange. What is your favorite recipe to make? Any comfort food you absoluely love? All time favourite: Doenjang Jjigae. Best comfort food ever: Kimchi Bokkeum Bap with an egg sunny-side up. All time german favorite: Boulette/Bulette (german meatball)! Do Germans enjoy Korean food? Have you prepared Korean food for your German friends? What was their reaction? Of course, some of them are now addicted to Korean food, and they even learned how to make Kimchi! I love all things design (like you Sarah). Thank you Miss Boulette for sharing this amazing recipe, I'm sure all of our readers will be thrilled to try it out! 1. Peel onion and leek, chop finely. Chop bacon finely, sauté with onions and leeks in a large saucepan. Add butter and sauté until onions are translucent. 2. Peel and dice potatoes, and sauté briefly. Add bay leaves and vegetable broth/water, reduce heat, and simmer mixture until potatoes are completely softened (about 20 minutes). 3. In the meantime, prepare topping: In a nonstick pan, cook black forest ham on low heat, drain on a paper towel. Cut the ham with kitchen scissors into thin strips. Set aside. Dice potatoes thinly and fry them crisp in the same pan with some oil. Drain Potato Croutons on a paper towel. Salt to taste and set aside. 4. Soup: When potatoes are completely softened, remove from heat. Remove bay leaves. Using a hand/emulsion blender, blend soup until smooth. Add cream and cider vinegar, salt, pepper, nutmeg to taste and let boil again. 5. 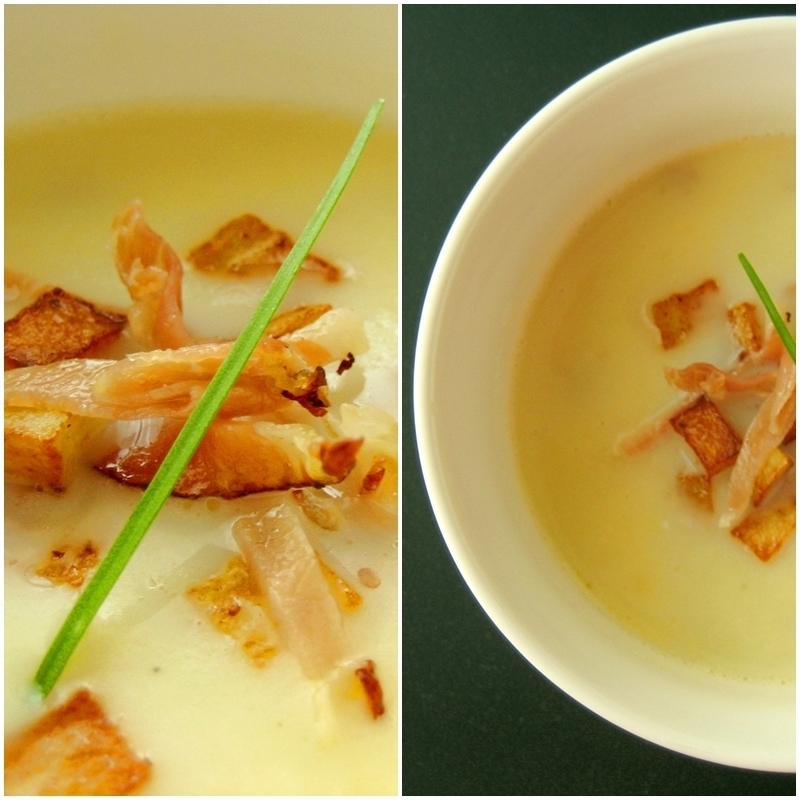 Serve soup topped with Black Forest Ham (bacon) and Potato Croutons. Garnish with some thyme or chive.